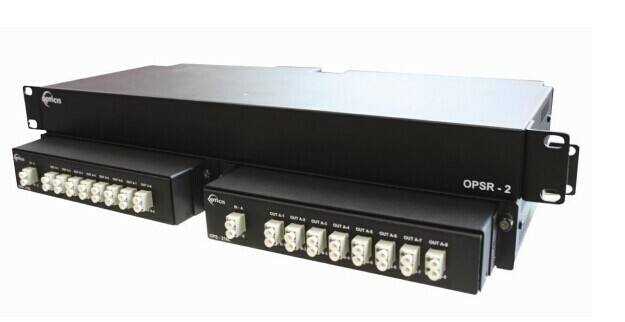 Nowadays, with the further popularization of the optical fiber communication, fiber optic splitter plays an increasing significant role in many of today’s optical network topologies. Although there are variations of splitter types, the two most commonly deployed splitters are FBT (Fused Biconical Taper) splitter and PLC (Planar Lightwave Circuit) splitter. So, when you deploy your network, what kind of splitter you should choose may be a problem for you. And in order to solve this problem, this paper will give you a detailed introduction of differences between FBT splitter and PLC splitter. Before you get to know the features of them, first you should know what them are. Next, each splitter will be introduced. FBT Splitter – FBT is a traditional technology that two fibers are typically twisted and fused together while the assembly is being elongated and tapered. The fused fibers are protected by a glass substrate and then protected by a stainless steel tube, typically 3mm diameter by 54mm long. FBT splitters are widely accepted and used in passive optical networks, especially for instances where the split configuration is not more than 1×4. The slight drawback of this technology is when larger split configurations such as 1×16, 1×32 and 1×64 are needed. PLC splitter – A PLC splitter is a micro-optical component based on planar lightwave circuit technology and provides a low cost light distribution solution with small form factor and high reliability. It is manufactured using silica glass waveguide circuits that are aligned with a V-groove fiber array chip that uses ribbon fiber. Once everything is aligned and bonded, it is then packaged inside a miniature housing. PLC Splitter has high quality performance, such as low insertion loss, low PDL (Polarization Dependent Loss), high return loss and excellent uniformity over a wide wavelength range from 1260 nm to 1620 nm and have an operating temperature -40°C to +85°C. In the past few years, splitter technology has made a huge step forward, especially the PLC splitter technology. This situation resulted in that PLC splitter has become a higher reliable type of device compared to the traditional FBT splitter. Although being similar in size and appearance, the internally technologies behind these types vary, thus giving service providers a possibility to choose a more appropriate solution. Operating Wavelength – As is mentioned above, PLC splitter can provide a range of operating wavelength from 1260 nm to 1620 nm. But FBT splitters only support three wavelengths (850/1310/1550 nm) which makes these devices unable to operate on other wavelengths. Operating Temperature – Commonly, FTB splitter is to a high extent temperature sensitive, providing a stable working range of -5 °C to 75 °C. While PLC splitter operates at wider temperature range (-40 °C to 85 °C), allowing its deploying in the areas of extreme climate. Split Ratio – The split ratio of FBT splitter is 1:8 and it can be higher with higher failure rate. The split ratio of PLC splitter can go up to 64, which is equal to all branches, thus providing a high reliability. Cost – FBT splitter is made out of materials that are easily available, for example steel, fiber, hot dorm and others. All of these materials are low-price, which determines the low cost of the device itself. PLC splitter manufacturing technology is more complex. It uses semiconductor technology (lithography, etching, developer technology) production, hence it is more difficult to manufacture. Therefore, the price of this device is higher. In a word, Compared with FBT splitter, the capacity of PLC splitter is better, but costlier than the FBT splitter in the smaller ratios. You can choose it according to your requirements. Fiberstore offers both FBT splitter and PLC splitter with good quality and low price. Whether in FTTx systems or in traditional optic network, Fiberstore splitter can help you to maximize the functionality of optical network circuits. This entry was posted in Fiber Optic Splitters, PON Systems and tagged fiber optic splitter, FTB Splitter, PLC Splitter on October 27, 2015 by Admin. Are You Familiar with Fiber Optic Coupler? Optical coupler is the extremely important component in a number of phonics devices and systems that couple or split light through wave-guides or fibers. Fiber optic couplers can be either active or passive devices. The difference between active and passive couplers is that a passive coupler redistributes the optical signal without optical-to-electrical conversion. Active couplers are electronic devices that split or combine the signal electrically and use fiber optic detectors and sources for input and output. A basic fiber optic coupler has N input ports and M output ports (showed in the above picture) which typically range from 1 to 64. But generally, they are four-port devices and their operation relies on the distributed coupling between two individual waveguides in close proximity, which results in a gradual power transfer between modes supported by the two waveguides. The brief principles of four-ports fiber optic coupler is given in the following picture. If light enters into the port 1, it will be splitted into the output ports between ports 3 and 4. And port 2 functions in the same way. And sometimes, one of port 1 or port 2 is unused, so the fiber optic coupler will act as a Y or T coupler (Y or T stands for the form of transmission route). As we have known before, fiber optic coupler can couple or split light, so it also can be called fiber optic splitter. In fact, splitter is named for the function of the device, coulper named for its working principle. These days, the most popular types are fused fiber optic couplers and planar lightwave circuit (PLC) splitter. Fused fiber optic coupler is a kind of fiber optic couplers, which is formed based on fused biconical taper (FBT) technology. Therefore, it is also known as FBT coupler. It can work on three different operating bands such as 850nm, 1310 nm and 1550nm. Planar Lightwave Circuit (PLC) Splitter is designed to manage the power of optical signals through splitting and routing. It can provide reliable light distribution and is based on planar lightwave circuit technology. Compared with FBT fused coupler of lower cost, PLC splitter has wider operating wavelength range which is from 1260 nm to 1620 nm, and wider temperature range from -40ºC to +85ºC, better uniformity, higher reliability and smaller size. Currently, fiber optic coupler is widely used in that it can support FTTX (FTTP, FTTH, FTTN, FTTC), passive optical networks (PON), local area networks (LAN), CATV systems, amplifying, monitoring system and test equipment. As a result, fiber optic coupler with good quality is required. Fiberstore can offer you various kinds of fiber optic couplers with good quality, including fused fiber optic coupler and Planar Lightwave Circuit (PLC) Splitter. For more information, you can visit Fiberstore. This entry was posted in Fiber Optic Assemblies, Fiber Optic Splitters and tagged Fiber Optic Coupler, fused fiber optic coupler, planar lightwave circuit (PLC) splitter on August 27, 2015 by Admin. FTTx is short for the Fibre-to-the-X, where X can denote a number of destinations. These include Home (FTTH), Premise (FTTP), Curb (FTTC), Building (FTTB), User (FTTU) and Node (FTTN). Clearly, however, there are overlaps in meaning. FTTP is similar to FTTB, and FTTC resembles FTTN. As consumers world over have been demanding more and more bandwidth hungry applications at the network, networks of the future will be digital and intelligent and will offer high transmission capacity and flexible bandwidth. In addition to being easily accessible while offering services that are personalized and tailored to individual need. To support it, FTTx technology, as a effectively one, is widely used in our life nowadays. Passive Optical Network (PON), a new technology for networking infrastructure, is widely deployed in today’s FTTx network in new installations and is generally considered suitable for consumer broadband services. As an indispensable component of Passive Optical Network (PON) systems, PON splitter is used to distribute or combine optical signals, installing in an outside plant enclosure and giving carriers the ability to split optical signals to multiple homes or businesses. According to the Fiber Optic Splitter principle, there are two kinds of PON splitter: EPON OLT/EPON ONU/GPON ONT/GPON OLT. Between them, PLC splitter is valued by its wider operating wavelength because PLC splitter can work on 1260-1650nm wavelength, while FBT can usually work on three different operating wavelengths. What’s more, depending on its split configuration, there are types of PLC splitter designed in 1xN and 2xN, such as 1×4, 1×8, 1×16, 1×32, etc. or smaller, like 1×2, 1×4, etc. for the FBT splitter. In addition, in order to meet clients’ different requirements, different package are produced by the manufacturers depending on subscriber conditions or cable length, and even the connectors. Fiberstore offers a integrated product line of these different types of PON splitters. Fiberstore’s fiber optic splitters can be terminated with different kinds of connectors. They are protected from exposure and damage by their packaging. Surrounded by superior cable management, technicians need less time to route fiber in the cabinet, saving operating costs. Available in configurations from 1×2 up to 1×64, the modules can be ordered in adapter port or pigtailed versions. We are specialized in supportting a perfect work for your FTTx solutions. Want a highly splitter product? Want your network working perfectly and stably? Fiberstore is your best alternative! We offers all good quality products with reasonable price. To contact Fiberstore, please log in our website! This entry was posted in PON Splitters and tagged EPON OLT, EPON ONU, PON Splitters on May 19, 2015 by Admin. Function of a fiber optic splitter, as far as I know, it is used to distribute a signal to more than one fiber optical receiver, such as in DVB-T services, because of that can reduce the RF performance of the analogue fiber optic connection, there is a point i have to explain, RF, just Radio Frequency, it is usually in telecommunication industry. In fact, we are bound to say that that it does offer the advantage of a reduction in the number and therefore cost of optical transmitters. And relative, multimode fiber splitter distributing a signal from a single source to multiple destinations offers a significant performance advantage over the use of optical splitters. The exponential increase in demand for bandwidth is forcing access networks to extend the amount of bandwidth they can support. Traditionally based on “static” allocation of time slots per user (or TDM) and passive optical splitters, these systems are struggling to keep pace with the rise in line-rate as it cuts away link budget and therefore splitting ratio and network reach. One attractive alternative for passive splitting is the point of wavelength division. We know that fiber optical splitter are available in a number of split rations, they are characterised by the inherent loss associated with the split ratio, added to a excess loss that depends on the design and construction of the splitter and the optical splitters themselves are very compact typically 65 x 15 x 15 mm, and split rations of 1×2,1×4, 1×8, 1×16 optical splitters are examined and compared with a straight through 1×1 system. Optical losses quoted are typical of readily available optical splitters. There are two techniques for manufacturing Splitters: Fused Biconical Taper (FBT splitter) and Planar Lightwave Circuit (PLC splitter). A 1×2 FBT splitter is made in precisely fusing two fibers together. Higher split ratios are obtained by cascading multiple 1×2 splitters. A PLC splitter consists of a microscopic optical circuit that is typically etched in silicon. We fiberstore have some branches in Europe and US, of course some of the Asian regions, probably only suitable solution for high bandwidth demand with a long reach is using optical cable to customers (FTTx). One of the ways is using some type of Passive Optical Network (PON), such as ftth splitter. Gigabit PON (GPON) is the most often type used by European and US providers (in addition to APON and BPON) while providers in Asia predominantly use EPON/GePON. Probably only suitable solution for high bandwidth demand with a long reach is using optical cable to consumers (FTTx). One of the approaches is using some type of Passive Optical Network (PON). Gigabit PON (GPON) is the most often type used by European and US providers (in addition to APON and BPON) while providers in Asia predominantly use EPON/GePON. At this point, the splitting device simply divides the optical power into N separate paths to the subscribers. The number of splitting paths can vary from 2 to 64. 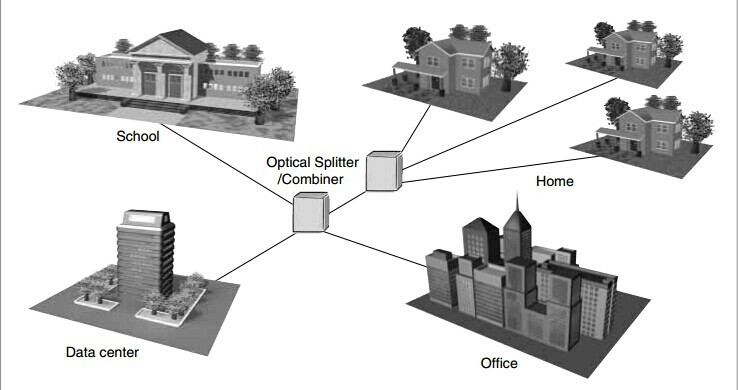 From the optical splitter, individual single-mode fiber strand run to each user (home, businesses, etc.). Branches components of a fiber optic communications network, experimental fiber optic devices and any other application requiring highly reliable splitting combining of optical lines. 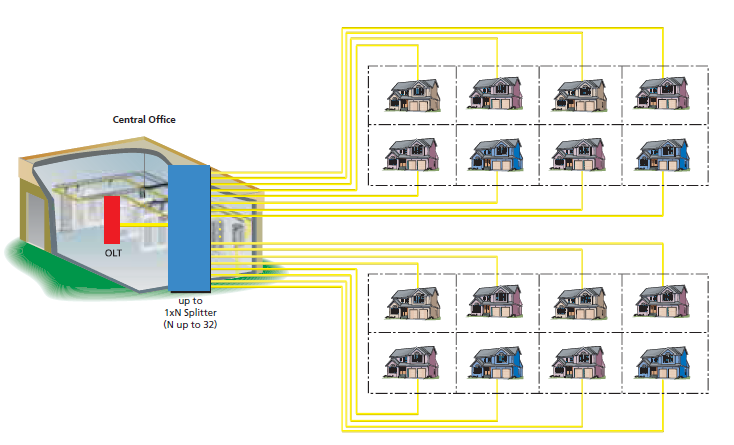 The optical fiber transmission span from the central office to the each user can be up to 20km. Fiberstore provides devices to solve this problem. If you have the needs. Fiberstore will be your choice. This entry was posted in Fiber Optic Splitters and tagged ftth splitter, multimode fiber splitter, PLC Splitter on January 6, 2015 by Admin. A fiber optic coupler is a device used in fiber optic systems with single or more input fibers and single or several output fibers, which is different from WDM devices. WDM multiplexer and demultiplexer divide the different wavelength fiber light into different channels, while fiber optic couplers divide the light power and send it to different channel. Most types of couplers work only in a limited range of wavelength (a limited bandwidth), since the coupling strength is wavelength-dependent (and often also polarization-dependent). This is a typical property of those couplers where the coupling occurs over a certain length. Typical bandwidths of fused couplers are a few tens of nanometers. In high-power fiber lasers and amplifiers, multimode fiber couplers are often used for combining the radiation of several laser diodes and sending them into inner cladding of the active fiber. A basic fiber optic coupler has N input ports and M output ports. N and M typically range from 1 to 64. M is the number of input ports (one or more). N is the number of output ports and is always equal to or greater than M. The number of input ports and output ports vary depending on the intended application for the coupler. Couplers can also be made from bulk optics, for example in the form of microlenses and beam splitters, which can be coupled to fibers (“fiber pig-tailed”). Fiber optic couplers can either be passive or active devices. Passive fiber optic couplers are simple fiber optic components that are used to redirect light waves. Passive couplers either use micro-lenses, graded-refractive-index (GRIN) rods and beam splitters, optical mixers, or splice and fuse the core of the optical fibers together. Active fiber optic couplers require an external power source. They receive input signals, and then use a combination of fiber optic detectors, optical-to-electrical converters, and light sources to transmit fiber optic signals. Types of fiber optic couplers include optical splitters, optical combiners, X couplers, star couplers, and tree couplers. The device allows the transmission of light waves through multiple paths. Fused couplers are used to split optical signals between two fibers, or to combine optical signals from two fibers into one fiber. They are constructed by fusing and tapering two fibers together. This method provides a simple, rugged, and compact method of splitting and combining optical signals. Typical excess losses are as low as 0.2dB, while splitting ratios are accurate to within ±5 percent at the design wavelength. The devices are bi-directional, and offer low backreflection. The technique is best suited to singlemode and multimode couplers. Choices for fiber optic coupler also include Single window narrow band, Single window Wide band, and Dual window Wide band fiber optic coupler. Single window fiber optic coupler is with one working wavelength. Dual window fiber optic coupler is with two working wavelength. For Single mode fiber, is optimized for 1310 nm and 1550 nm; For Multimode fiber, is optimized for 850 nm and 1310 nm. This entry was posted in Fiber Optic Splitters and tagged Fiber Optic Coupler, multiplexer and demultiplexer, Optical Splitters on June 28, 2013 by Admin.